There is a new and innovative trend of leadership training in the Northwest. What started in 2009 as a group of Tribal College students and elders, has grown into a national organization that supports the growth of Native communities through the work of their Native Youth. 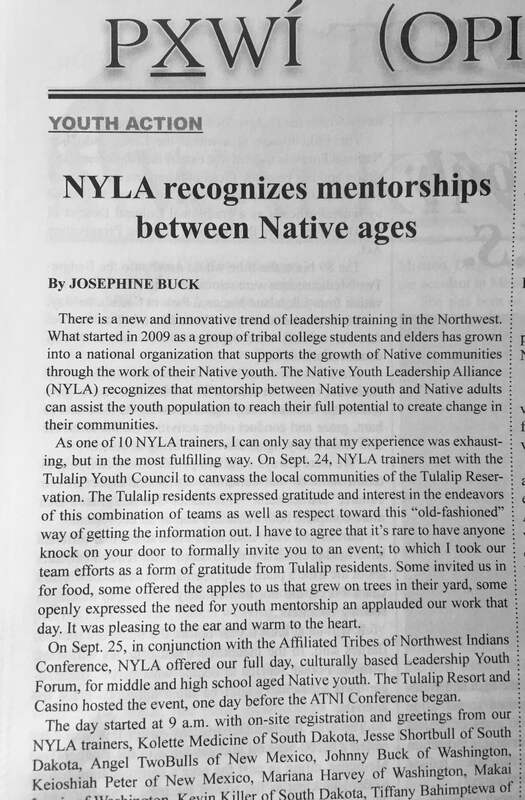 The Native Youth Leadership Alliance (NYLA) recognizes that mentorship between Native youth and Native adults can assist the youth population to reach their full potential to create change in their communities. 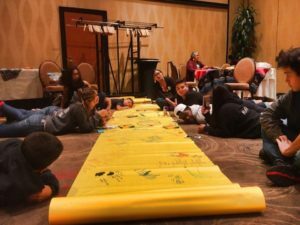 As 1 of the 11 NYLA trainers, I can only say that my experience was exhausting, but in the most fulfilling way. 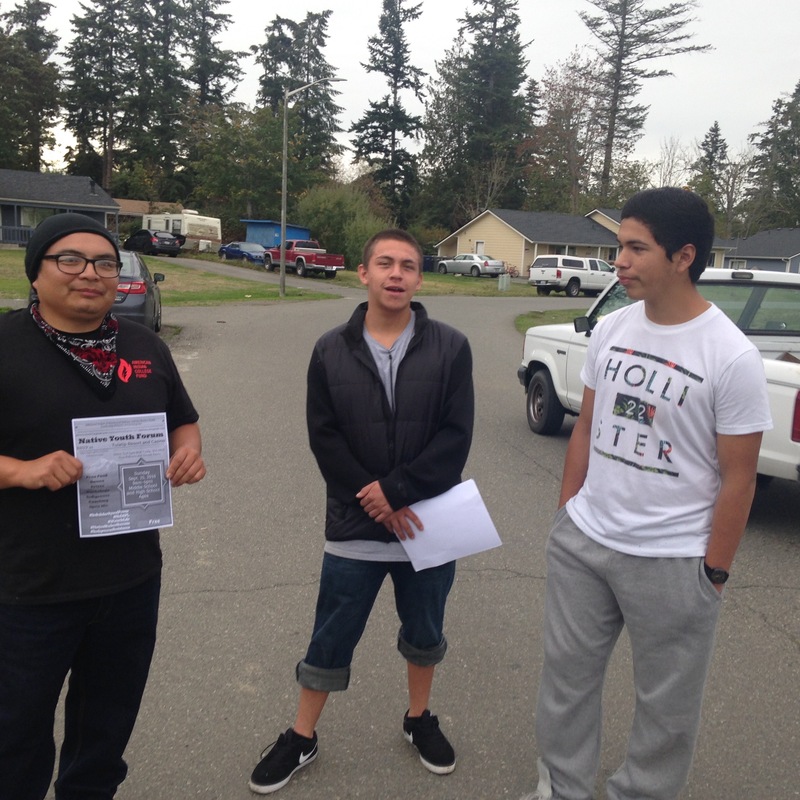 On Saturday, September 24, NYLA trainers met with the Tulalip Youth Council to canvass the local communities of the Tulalip Indian Reservation. The Tulalip residents expressed gratitude and interest in the endeavors of this combination of teams as well as respect toward this “old-fashioned” way of getting the information out. I have to agree that it’s rare to have anyone knock on your door to formally invite you to an event; to which I took our team efforts as a form of gratitude from Tulalip residents. Some invited us in for food, some offered the apples to us that grew on trees in their yard, some openly expressed the need for youth mentorship an applauded our work that day. It was pleasing to the ear and warm to the heart. 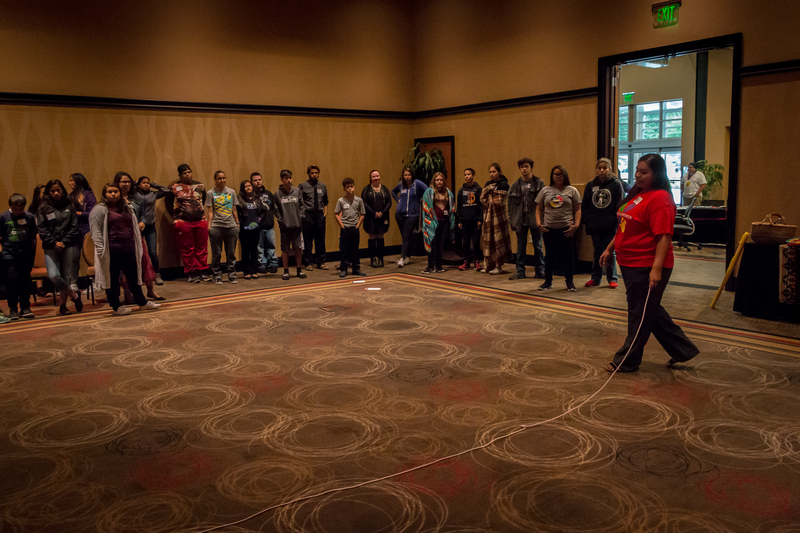 On Sunday, September 25, 2016, in conjunction with the Affiliated Tribes of Northwest Indians (ATNI) Conference, NYLA offered our full-day, Culturally-based Leadership Youth Forum, for Middle School and High School aged Native youth. The event was hosted by the Tulalip Resort and Casino, one day before the ATNI Conference was to begin. The day started at 9am with on-site registration and greetings from our NYLA trainers. These trainers are: Kolette Medicine of South Dakota, Jesse Short Bull of South Dakota, Angel TwoBulls of New Mexico, Johnny Buck of Washington, Keioshiah Peter of New Mexico, Mariana Harvey of Washington, Makai Lewis of New Mexico, Kim Smith of New Mexico, Kevin Killer of South Dakota, Tiffany Bahimptewa of Arizona, and myself Josephine Buck of Washington. Two of our NYLA fellowship present were Katie Swan of Washington and Burdette Birdinground of Washington. 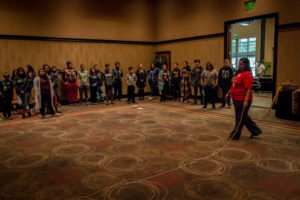 At 9:30am, I started the day with a teambuilding Icebreaker called “Lava Rope.” If you can imagine the setup of two jump rope twirlers, and a group of 28 youth on one side of the twirling rope. I explained the goal is to get everyone on the other side of the rope with four rules: 1) no one is to touch the rope 2) one person per twirl 3) if the rope twirls and no one runs, everyone starts over 4) encouraging words only. After knowing these rules, the youth were given retry after retry to get everyone through the twirling rope to the other side. Parents were laughing and cheering for their kids. When we knew that the 28 youth started out getting only 3 and 4 people through before starting over again, we observed how they began to plan, to talk to each other, and to make sure all are ready before starting. This was the teaching of this game. The entire room went joyful when they achieved their goal. What a way to begin the day. 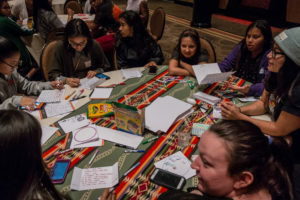 We had ‘over 60 youth’ representing 16 different Tribes: Swinomish, Shoshone, Northern Paiute, Colville Tribes, Tulalip, Yakama, Muckleshoot, Navajo, Blackfeet, Puyallup, Haida, Sioux, Suquamish, Samish Indian Nation, Warm Springs, and Tlingit. Eleven youth from our own Yakama Nation attended, one being our current Miss Yakama Nation Chrissy Jim. The day was officially ended in the same way it began 7 hours earlier, with prayer and with closing reflections. I may be able to speak on behalf of our NYLA team, that each reflection was heartfelt and we could only thank each of the youth, parents and supporters for being present.